When Jim and I got a new couch this past Christmas, we had a mutual agreement that Saigon would not be allowed up on it. This was easier than it sounds because Saigon is pretty much scared of anything, especially anything new. 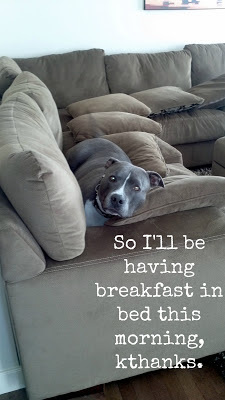 And not allowing him up on the couch from the beginning set a precedent, and this was much easier than trying to break the habit months down the road. 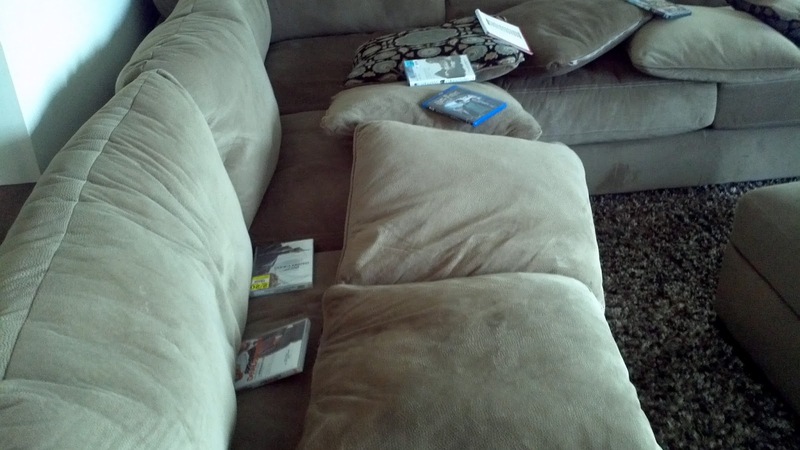 See how the pillows are all down? That used to be enough to deter him from going on the couch. He was so unfazed by being caught in action that he made no effort to get off the couch, (thus allowing me the time to get out my phone to take a picture). Six months of Saigon staying off the couch and all of a sudden he decides it is the spot he wants to sleep! 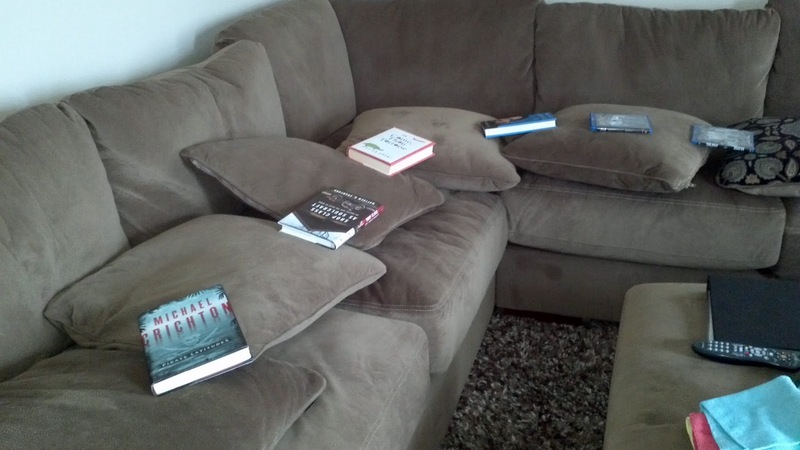 Clearly, the pillows weren't doing the trick anymore. DVD's pushed out of the way and drool on the pillows. Seems Saigon is getting braver. Well then. Saigon is severely scared of the swiffer. Aww ... that is TOO funny! 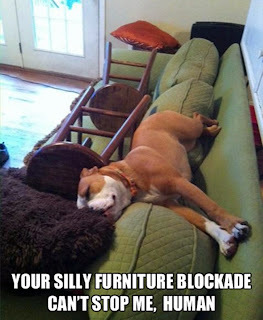 We used to put chairs on the couches to keep the dogs off, but then we just let them up. NOW we just got new couches and they don't seem to be all that interested in them. We put up a blanket on the big couch just in case Bailey decides to go up but I haven't noticed any sign of her being on it. We just make sure there are lots of dog beds on the floor and the dogs seem to like laying on them! LMAO! It is hilarious.....and he just gets braver....week by week! Jim says it's all our fault (as in you, and me! )...because we were "pat-patting" the couch to encourage him to come up lol. Hahaha I seriously cannot stop laughing! He is so funny. Reminds me of the years growing up with Jake and mom having to block off the leather couches and he would still find a way on. He's still not allowed on any other furniture in the house though. And strangely (so far at least!) he seems to get that. Seems we have the opposite issue! Saigon is allowed up on all the other furniture in our house (the couch upstairs has even been declared "his couch"!). I do miss cuddling with him on the couch though, that's for sure, but it's nice not having to wipe the couch down and/or constantly wash the blankets we would use to protect it. 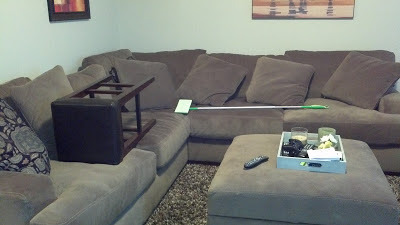 So far, the swiffer is turning out to be a good deterrent! OMG! You should see the makeshift barriers I have all over my house. The more I hear about Saigon, the more I think he's just a toddler in disguise. HE IS! Except worse. Because I can't "reason" with him lol. HAHA, that is so cute and funny! Hopefully it'll actually work though! !